I’m probably a little bit late to the ‘juicing party’ but after looking at the pros and cons, I decided to join in. And I’m loving it! It’s easy to see why juicing is super popular with health conscious people all over the world. It is a healthy, natural way to get a big dose of vitamins and minerals into your body. Plus, while I love my fruit and veg, sometimes there are days when I simply don’t eat enough of them. 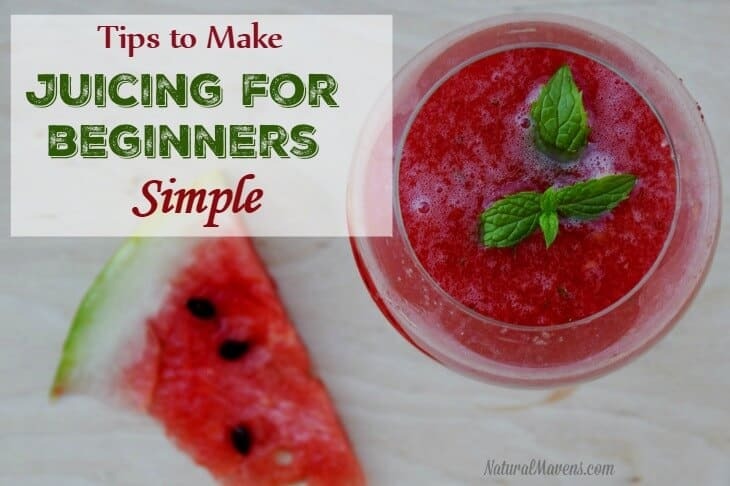 But if you are a beginner like me, it can be a little daunting trying to get started. The good news is, the worst that can happen is you end up with a juice you don’t like. No problems, pass it on to someone else or tip it on the garden! Like many things, it is best to just jump in and get started. So to help, I’ve listed my best tips to juicing for beginners below. These are the things that helped make juicing a lot easier for me and I hope they help you too. First of all, you can juice pretty much any type of fruit or vegetables. Don’t be scared to experiment, and as I said before, if if doesn’t work out, no problem. Just think “the more the merrier” both in the variety of produce and in the colors you choose. More colors will mean a wider range of nutrients in the juice. So, as you walk through the supermarket, consider trying something you never have before. Get out your recipes and make a list of all the ingredients you will need. Planning makes it much easier to juice when you need to. Get organised and prepare your vegetables and fruits so they are ready to go when you want to juice. There are some tips for getting organised here. At the very least, prepare the night before a morning juicing session. This means washing the produce, peeling if needed (but remember there are lots of nutrients locked into the skin), and storing it overnight in airtight containers. One thing that juices are definitely lacking is protein. This can be overcome by adding protein powder to your juice before drinking. The addition of protein powder will not only provide a source of energy, but helps to make you feel full. Because of this, juices with protein powder added are often used a meal replacement. Make sure to buy a high quality protein powder, not a cheap one with lots of filler ingredients. Where your budget will allow, choose organic produce. If your budget can’t stretch to all organic, at least consider buying organic for the ‘dirty dozen’. While organic is more expensive, you will ingest less pesticides and more nutrients compared to regular produce. Also check out local farmers markets for pesticide free produce options. This is particularly important if you don’t buy organic as it removes bacteria and some of the pesticide residue. For organic produce, a quick rinse will ensure any loose dirt is removed. Washing is especially important with leafy greens where dirt can be stuck in between the leaves. Timing is everything when it comes to juicing. You don’t want to be drinking your healthy fresh juice on a full stomach! If you do, your body just won’t absorb all those lovely nutrients as well and some of them may even go to waste. A juice is best drank on an empty stomach – like first thing in the morning. It’s not going to fill you completely (unless you add in protein powder), but it will give your body a great chance to absorb all that goodness. Then, you can sit down to a meal an hour or so later. Drinking your juice quickly puts a LOT of pressure on digestive enzymes that have to work extra hard to digest juice. The best way to drink juice is to sit back, relax and sip slowly. Take care of your stomach and digestive tract because they are really sensitive. If your juicer has a pulp basket, you will need to line it with a plastic bag. This makes cleaning up the juicer afterward much easier. Plus, there are loads of ways to use the pulp. Here’s a few ideas to get you started. Another reason to make it easy to get the pulp out of the machine is so you can rerun the pulp. This is a great tip, that can help to squeeze every last bit out of nutrients from your produce. It may not always be worth the effort, but if the pulp is damp, it is certainly worth putting it back through the machine. Depending on the juicer plus the fruits and vegetables used, it may or may not be worth rerunning the pulp. Again, just experiment and see what works for you. You can tear up greens or cut up larger vegetables so they fit through the feeding chute of the juicer. Don’t ever try and force produce into the juicer or you risk breaking the machine. This might seem obvious, but it is really important. User manuals are the best source for learning best practices for cutting produce and understanding which speeds should be used for which fruits and vegetables. Knowing the right speeds will not only yield you the best juice, but will prevent breakage of the machine. For example, harder vegetables are usually best juiced on high, while softer vegetables, such as cabbage and spinach, are best juiced on a lower setting. The user manual will also give a good guide on how to clean your juicer properly. Each one is a bit different and taking the time to clean makes it much easier for the next time you juice. As a general guide, you should clean it right away so as to keep bacteria from building up inside the juicer. If it is dishwasher safe, you can put those parts in the dishwasher. Otherwise, you should scrub the juicer out with hot or warm water and a mild dish soap. Allow the juicer to dry on a drying mat rather than drying it out with a towel as this can get towel fibers in your next batch of juice. Juice will start to oxidize the minute it comes into contact with air, and as it oxidizes, the nutritional value starts to decrease. So, it is important to drink your juice as soon as possible. Remember that this is not store bought juice full of preservatives so it will not keep fresh as long. If you aren’t drinking your juice straight away, put it in a tightly sealed glass or BPA-free plastic airtight container in the refrigerator. Drink it within 3 days (72 hours) to reduce the risk of any microbial growth. Juicing is really such a great way to kickstart your day and health. It continues to grow in popularity and for good reason. And it is great that we can make these little glasses of health right in our own homes! 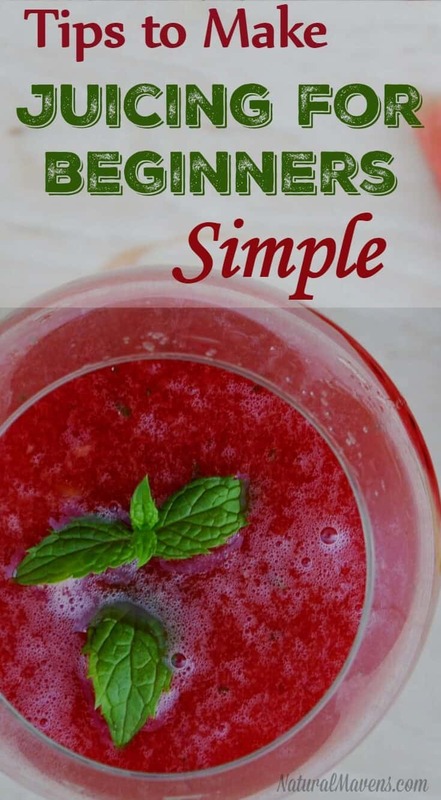 I hope that if you have been thinking about it, or are just getting started that these tips to juicing for beginners have been helpful. I look forward to sharing more on my juicing journey. But for now, it’s time to get juicing! Great article! How much exactly is a small cut of beet? Thanks Melissa. A small cut of beet would be approx 3oz (90g). How many small cuts are in one beet? Approximately. And can you use a ninja instead of a juicer for the 3 day cleanse? Approximately 2 small cuts for a regular size beet. A ninja will ‘blend’ rather than ‘juice’ so it really depends on what you are trying to achieve with the cleanse.